Day in and day out, we all get asked for personal information - when we apply for credit, fill out forms on the internet, register for events, visit the doctor and enroll in classes at the local college, just to name a few occasions. But generally, we give little thought to what happens with the information we have provided. 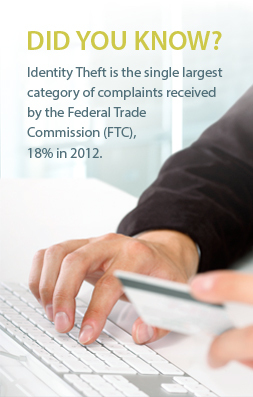 It's no wonder that identity theft is the fastest growing type of crime in the United States. IdentityIQ was formed to help provide peace of mind to individuals at different stages in their financial lifecycle. We offer a carefully selected suite of identity and credit-related services that harness and integrate the power of the most advanced business information resources to inform, protect, alert, and assist you in the event of identity theft or credit reporting problems. working diligently and personally with our customers to help fix identity and credit report issues you might experience. We thank you for considering our services and welcome your input and feedback at all times. Please Contact Us if you have any questions.